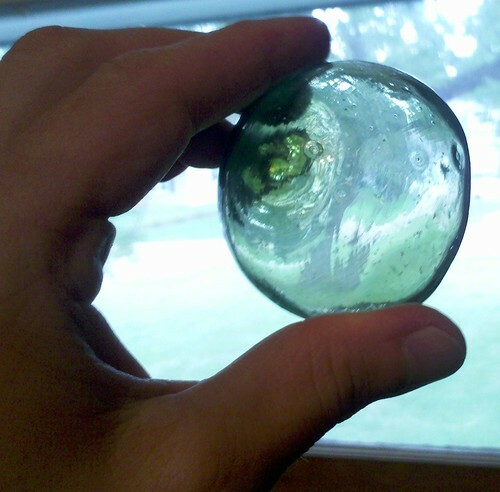 Down at my mom’s recently, I noticed a couple of these glass globes floating in the fish pond next to her porch and asked her what they were. She told me Dad had found them when he was stationed in Korea back in the early ’70s, and that they’re glass floats from old fishermen’s nets. I liked the thought of Dad halfway around the world in his early 20s, finding these things which were no longer useful, but thinking they were neat and unusual enough to keep a few, so I asked Mom if I could take one home to keep on my desk.